Rounds 13, 14, 15, 16—All done! --Enough done that it's beginning to look different. See? A noticeable change since it was last seen! The shorter feather is beginning to have the stocking knit base to the “eye”--if you can't seen the difference yet—don't worry—it will be visible different in just another few rounds/days. 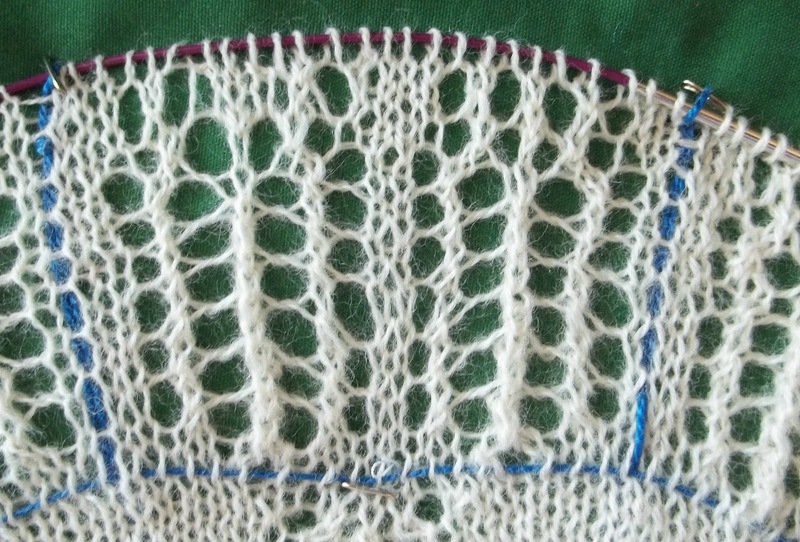 The detail that is clearest and easiest to make out, is the column of stocking knit stitches (2 for the most part) that divide the 2 feather motifs. The chart has 54 R's—Plus-- I added 4 extra, so 16 R (completed) aren't even 1/3rd of the chart. But 16 R's in 3 days, is nice steady progress. The round are once again getting longer --and feeling longer—I feel like it takes forever to complete a full round! Almost 200 stitches have been added already, (900 something stitches per round) and more to come, and then the eye! Any day now, it's going to be a project to just knit a single round in a day—forget doing 4! Yesterday, I got cramps in my arm as I finished up round 16--something that rarely happens. What pleases me most? 99.9 percent error free! There have been one or two missed (but picked up in the next round) yarn overs, but no major mistakes. Not a lot of tinking either. With 30 repeats in a round, it's easy to learn the pattern! I am getting ahead of myself! For now, its just work on chart 3, and don't make a mistake. No toe on the socks yet—I went to pick up my car yesterday after noon, and went shopping on the way home. Nothing much, just a zipper or two, and notion or two—Oh, and beautiful black linen remnant jumped out and demanded to be taken home—It might turn into a skirt –or if I can swing it—a dress. But all the shopping time cut into my knitting time. I also got a linen tunic/shirt disassembled—It was in the ironing basket, and I thought why iron it as is? It was way to big—so a cut down is on the way—With 3 skirts already cut down, the fourth and fifth can wait a day or two. Even cut down, the shirt will be over sized—but it will work as a light weight jacket—or even a a cover up for the pool. I am not going to shorten it--It's rather long for a shirt--if i were thinner, it could be/would be long enough to function as a mini dress! I am off to the doctors again today and tomorrow—Today's appointment should be relatively fast and easy-I'll bring May's socks with me to finish up the toe And an other sock kit, too. I am sure if I don't, I will end up having enough time to finish May's socks--and have time left over! If I bring along extra knitting, I'll be in and out, before I can finish. I know, I know, that is a sort of magically thinking.. but sock yarn is light weight—having some handy--(even if I end up not needing it) is worth the effort. I've been pretty smug, and proud of myself for getting 2 socks knit every month (for the past 5 months!) but reading about the knitting effort for the US Civil war in Knitting Traditions, —many knitters managed (somehow!) to knit a pair of socks a day (and not skippy little ones—but men's socks with 13 inch tall legs, and almost as long feet!) and some manage more than a pair a day! Amazing what you can do if you don't spent time writing a blog, or reading others blogs, or haunting Ravelry and other sites on line, isn't it? It sort of puts me in my place. I'll get a lot done on Friday—I have already been warned to expect the 15 minute procedure to take 3 hours from beginning to end—this will, no doubt, include lots of time to knit. My plan is to write up a short post tonight to publish tomorrow--If nothing else, there should be completed socks to showcase. I like Magical thinking. ;0) Good luck with your knitting at the 3 hour waiting room visits. Just thinking of those sock knitters hands and how they must have ached. I suppose that it kept their minds occupied, considering those terrible times, and since knitting is still a great comfort to many.